Giorgos Falagaris lives in Sougia and has been an independent driver for over 15 years, offering MINIVAN TRANSPORT SERVICES on the island of Crete. If you are looking for a convenient way to get to Sougia from the airport in Chania or Heraklion (vice versa), travelling with your family or in larger groups (up to 8 persons), choosing Giorgos’ MINIVAN is a perfect choice. Giorgos also arranges for individual travellers to share the MINIVAN, thus lowering the costs for each passenger, making his services more advantageous than taking the public bus. He also offers daily MINIVAN services between Sougia (port) and Omalos (Xyloskalo) for hikers of the Samaria Gorge. Furthermore, both individuals and groups may be interested in booking the MINIVAN to get from Sougia to the start of the Agia Irini Gorge, either to the top in Agia Irini or to the bottom at cafe Oasis, or to be picked up at either spots. 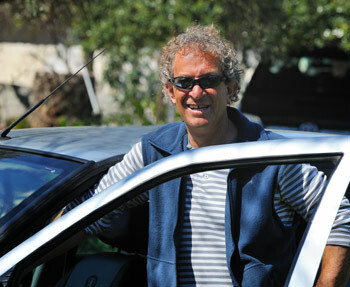 Giorgos Falagaris is a very friendly, careful, considerate and experienced driver who speaks good English. He will be happy to look after you at any time of the day or night all year round. Transport is offered in a brand new Peugeot Minivan that can carry up to 8 passengers. Please note that Giorgos is the only one to offer minivan services in the area of Sougia, so if you need a minivan to any of these destinations, you are well advised to arrange it in advance. You are very welcome to contact Giorgos to enquire or to make an instant reservation per mail, phone or whatsapp and you will receive a reply instantly. You can write in English, German, Dutch or Greek. E-mail: taxi_falagaris@yahoo.com Or use the e-mail address at the bottom of this page. If you make a reservation for an airport transfer, we will need the details of your flight (coming from, arrival time, airline, flight number). We will quote you a fixed price for your trip when you make your enquiry.